Imagine a Little Leaguer hurling a baseball off a mound that is 60 feet, 6 inches away from home plate. Or an 8-year-old Pop Warner player running 100 yards to paydirt. Or a pint-sized hoopster attempting to toss a regulation basketball through a 10-foot hoop. It wouldn’t make much sense to most parents. Yet, when it comes to ice hockey, some adults see nothing wrong with having a kid lugging a 6 ounce puck 200 feet down the ice and attempt to shoot it into the same net as an NHL player. “For the longest time, the sport of ice hockey was the only team sport in the United States that does not downsize to the age and the size of the kids,” said Mark Tabrum, director of USA Hockey’s Coaching Education Program. That’s about to change as starting in the 2013-14 season USA Hockey will put some muscle where its mouth is by requiring that all 8 & Under hockey will be played on a cross-ice playing surface, thus providing every association and Affiliate with a consistent and level playing field for the benefit of Mite players. The program is designed to help the development among Mite-level players by reducing the ice surface, increasing opportunities to touch the puck and shifting emphasis from playing games to fun, skill-developing practices. “This is just how hockey will be played in the United States in the future,” said Ken Martel, technical director of the ADM, who views the move as the next logistical step in the program that is now entering its fifth full season. “We want to provide the best experience and challenge our elite players to become even better. All we have done is change the size of the playing surface that our kids are playing on. It’s about fitting the playing surface to match the size of our kids, fitting the game to them and giving them the opportunity to have success." Affiliate presidents and many others around the country praised USA Hockey’s board of directors for creating the new rule, which they say will help close the loopholes that some have used to play by their own rules. “I think it was a great move by the board of directors to pass it and it’s something that a lot of the Affiliate presidents have been looking for for a couple of years,” said Joe Baudo, president of New York State Amateur Hockey Association. As part of the new rule, USA Hockey will create a special subcommittee consisting of Affiliate presidents and members of the Player Development Committee to consider requests to play a very limited number of full-ice games, particularly at the end of the season, to help this transition in the rare cases where an Affiliate thinks it’s needed. 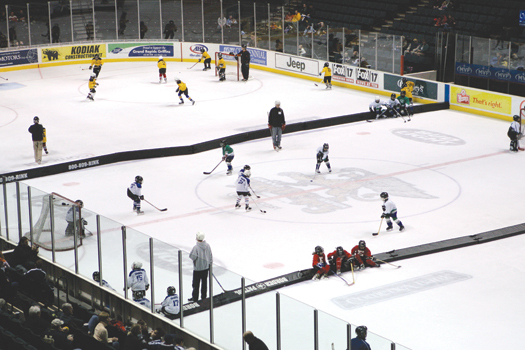 By cutting the ice into thirds using rink dividers, more young players will have an opportunity to play the game on a sheet of ice that is better suited to their size. “Simple mathematics tells you that they’re going to touch the puck more because you divide the amount of ice that they’re on by eight players instead of 12,” said Kevin McLaughlin, senior director of Hockey Development.